Il Best Western Lake Conroe Inn è situato nel centro di Montgomery. L'hotel è vicino alle principali attrazioni turistiche. Approfittate tutto l'anno del miglior prezzo garantito e di offerte esclusive. Cerchi relax e convenienza? Questo hotel di Montgomery si trova di fronte al lago Conroe e vicino a molte attrazioni, tra cui il Texas Renaissance Festival. Questo hotel di Montgomery, Texas, è a breve distanza da incantevoli ed emozionanti attrazioni, tra cui Lolly Farms, Kings Orchard, Splash Town, Woodlands Science and Art Center e l'Heritage Museum of Montgomery County. Molti ospiti ci fanno visita per praticare attività ricreative, come il nuoto, la pesca, la nautica, le moto d'acqua e il golf. Siamo inoltre vicini a Amber Springs, April Sound e molti altri luoghi adatti a matrimoni e ricevimenti. Sei in città per uno degli entusiasmanti eventi locali? 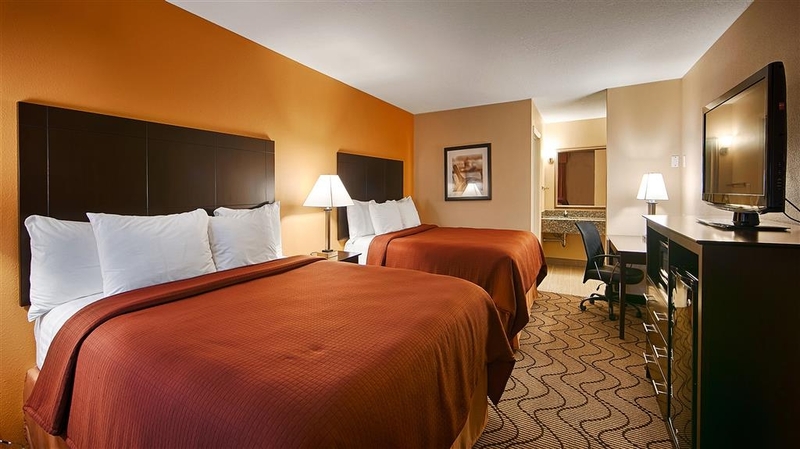 Il Crighton Theatre, il Cynthia Woods Mitchell Pavilion, il Lone Star Convention and Expo Center e il Texas Renaissance Festival si trovano a soli 29 chilometri circa da questo hotel del lago Conroe, fornendo un comodo accesso a concerti, spettacoli ed eventi. Gli appassionati di sport apprezzeranno la vicinanza al percorso naturalistico Sweetleaf Nature Trail, alla riserva nazionale W. Goodrich Jones State Forest e a sei campi da golf. I viaggiatori d'affari potranno usufruire di servizi efficienti grazie alla vicinanza di questo hotel di Montgomery, Texas, a Lefco, Southern Empress, Lakeview Marina, North Lake Conroe Paddling Company, WLS Drilling, Crane Valves e molti altre aziende locali. L'aeroporto intercontinentale George Bush si trova a circa 55 miglia. 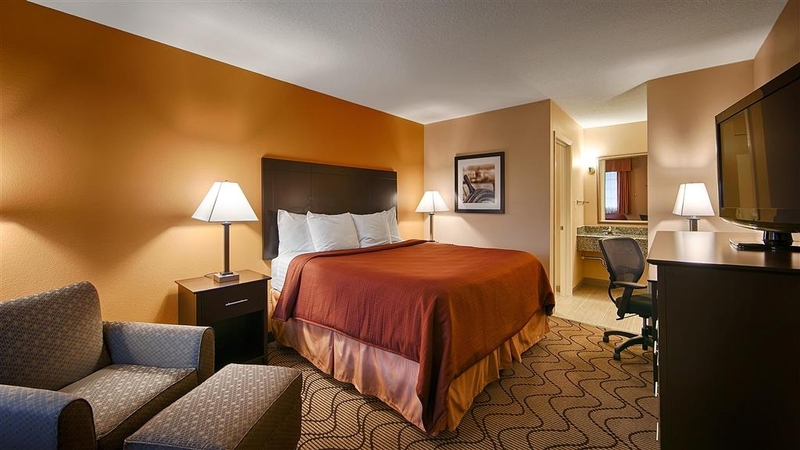 Ti sentirai proprio come a casa al Best Western® Lake Conroe Inn. Tutte le camere, pulite e arredate con gusto, dispongono di televisione via cavo/satellite con Showtime® e HBO®, microonde, frigorifero, scrivania e accesso gratuito a Internet ad alta velocità. Inizia la giornata al meglio con una colazione completa gratuita. Grazie alla nostra posizione di fronte al lago Conroe, non dovrai fare molta strada per poterti fare una nuotata o godere di viste sbalorditive e molto altro ancora. Potrai, inoltre, rilassarti e divertirti nella nostra piscina all'aperto e sulla nostra terrazza solarium. Gli ospiti potranno usufruire del business center, del parcheggio gratuito e delle strutture meeting durante il loro soggiorno in questo hotel di Montgomery. Per un soggiorno indimenticabile, prenota oggi stesso e risparmia al Best Western Lake Conroe Inn! Ti auguriamo un soggiorno gradevole! Had to stay in town for a wedding for a few days and the hotel was the only one around that charged a decent price for when we wanted to go. Had a fridge to store our food and we were able to sleep in peace. Cleaning ladies can through and helped us get new towels. Most of the amenities were closed or not available so that wasn't great but it was alright. Room that we received at this hotel was disgusting - filthy - night stand looked like someone shaved their face or back on it - bathroom and carpet was nasty - room smelled - bugs everywhere - beds looked as if the covers had just been spread back up and not fresh sheets - When I called front desk they said they were booked bust she could tell that this room had not been cleaned the day before - She said she could not help us - I ask that the manager be notified and she said she would leave a note for Manager. No one every contacted me - when checking out - a lady who claimed to be front desk manager said they would deduct around $5.00 from the bill. "rated lower cuz of loud traffic noise clean and good staff"
bring ear plugs we asked for a quiet room and we were on second floor but traffic noise is terrible had to get ear plugs. breaskfast is common at best. not much variety and mainly lower quality. small breakfast room but clean and well stocked Adverage size room was clean and comfortable . Tho no table to eat at they do have a small desk . nit picky but i like a table if i am staying more than a night. Television reception was poor and would come in and out. I requested to have this fixed on the first & second day of a 3-day stay. Repairs were never made after 2 requests. Room was clean but the bed was too hard for my liking. "Great Hotel and Access to highways"
The staff was great, check in was easy and quick. But once we got to the room to go to bed, after a long day, the beds were simply awful, very hard and uncomfortable, ended up sleeping in the room chair and the bed linens are quite a bit to be desired, almost non existing. "Great nights sleep...and what a view!!" We were in Conroe for a wedding. Stayed one night at this motel. Room was CLEAN and the bed and pillows very comfortable. Usual breakfast with coffee bar mornings. At the entrance is a small but nice pool with chairs. Because this motel is on a hill, the pool overlooks the highway and on to beautiful Lake Conroe. It would be a lovely location to stay when visiting the area in summer. So many good restaurants near by.. and right across the road was PAPA's On the Lake. One of our favorite summer burger places...and so much more. "Quick weekend trip to Oil city Triathlon"
Good location, fairly quite property considering it sits on Hwy 105. Close to everything lake related. A little dated but clean bed comfortable. Staff nice and helpful. Would stay again if in the area. Stayed here for a Wedding near by. Room was spacious and very clean. Front desk very accommodating for early check in to get ready for Wedding. Besides waffles for breakfast they had biscuits and gravy.. Husband said coffee was very good. The desk clerk was friendly and helpful. The room had a foul odor, the air conditioner was in poor condition and made a terrible racket. There was a sign wanting cleaning help, which may be the reason for the issue with the bedding. We were in a room upstairs at the back of the building, the lighting was good but attracted so many bugs. The bugs covered the walk way, the door and the ceiling of the room. We have stayed at Best Westerns for many years, but would not recommend this location. Booked this hotel some time ago and wished we had waited. The price difference was around 30 dollars. The hotel was clean and today and well maintained with a small swimming pool. Downside is that the food paces are across the road without safe crossing points also you need to be sharp on your Turing into the hotel after the lights. Breakfast was decent enough with a good variety on offer. The toiletries in the bathroom were used. There were insects in the room and around the building. There were cigarette burns in the bedding and no fitted sheet. All in all, what I'd expect from an econolodge at $40/night, not a best western. Truly the worst BW I've ever stayed in, and I will be taking a hiatus from your brand for a long time. We had 19 rooms for my daughters wedding at the nearby Pine Lake Ranch wedding venue. They went over and beyond to meet our needs even though it was Labor Day weekend and they could of had used their rooms for holiday travelers. "Best Western in Montgomery County Texas"
This hotel was clean, affordable, and people were nice. I would definitely stay here again. I decided to get this hotel because we needed a place to stay before moving into our new apartment and it has a view of the lake! Reasonable, clean comfortable room. Fairly easy to get to from I-45. Nice pool area and you are right across the street from the lake. Just up the street on the lake is a nice park with picnic tables and looked like roped off swimming area. This hotel is in a good area. "Good, safe, quiet, very nice." I liked having a microwave and good size refrigerator so that I limit eating out, although there are many dining options nearby. We were there to attend a wedding on Lake Conroe and felt this was a great choice for a good price.The only negative was that the AC worked very well but kept blowing the curtains up. Also, just make sure you actually shut the door of the room. Due to the carpet i found that I thought the door was closing behind me but it did not shut all the way. The hotel is on a large fairly busy street but the room was quiet. Lots of shops nearby. Good choice. Nice clean rooms. Helpful and attentive staff. Nice view of the lake. Well maintained pool. Good breakfast choices. Onsite parking with easy access in and out. Close to good restaurants. I enjoyed my stay. Kirstin very nice. great recommendations for food. Breakfast was hot and coffee good. Bed very comfortable and room was clean. Right accross from Lake Conroe, which is beautiful and every morning and night had deer in the field next to hotel. "Stayed a week during our move with dogs"
Very convienent, nice staff, clean rooms with great beds! Good breakfast room, waffle machine, eggs, biscuits, fruits. Yogurts, choices of juices & great coffee. We have dogs & we're moving to Montgomery it was convenient for walking dogs & lots of food and shopping around the area. I've stayed in a few Best Westerns, and they are all fairly consistent with appearance and amenities. I know what I'm getting with a stay here, and it's great for short trips - having all the necessities. This one is particularly nice, because you walk outside and see the beautiful Lake Conroe. This hotel is very clean. The room was clean and neat. The breakfast had a lot of choices including eggs, bacon, sausage, waffles, yogurt etc. I, female was traveling by myself and felt very safe. I will definitely stay here again. "The staff here made the stay worthwhile!" Thanks to Carrie and her staff, our stay was very comfortable and she did everything possible to accommodate our wedding party. Definitely worth staying here for the value and the ease of making sure everyone was comfortable. We stayed here one night and wouldn't consider going back. The hotel was very noisy from outside noise and there was a party going on in the parking lot until after 2 AM. We could hear every step that the people in the room above us took. The door to our bathroom wouldn't shut and the room smelled very musty when we walked in. Check in and out they make so convenient. 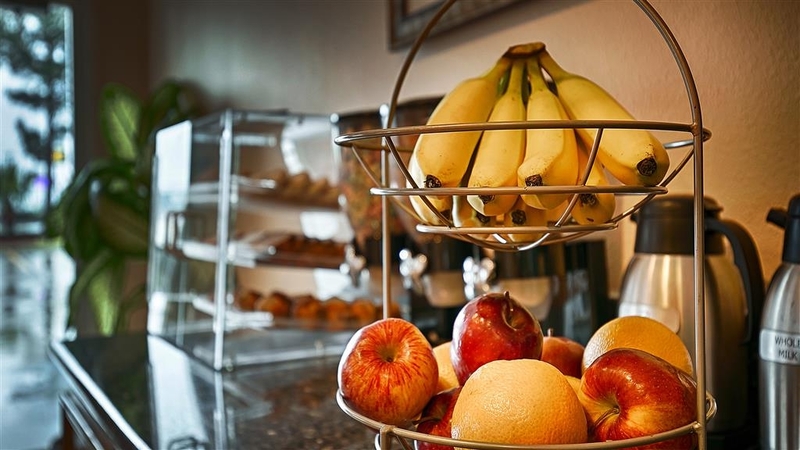 Rooms are clean, beds are very comfortable and the breakfast which is included is fantastic. For all it has to offer and the location I don't think you can find better.Best run BW, I've stayed. "Awful TBest Western In Montgomery Texas"
Don't go there, it's pitiful . If you want to have your identity stolen check into this flop house. If you want to be double billed check into this roach motel. If you want your clothes to stink check into this hell hole. It is the worse excuse for a hotel ever. The room was pleasant, the bed was very comfortable, amenities and personnel were pleasing and accommodating. Best of all - it was close to the Texas Renaissance Festival! Probably will return next year. I like the area that this Best Western is located. However, the price I had to pay to stay one night was overpriced, especially since the tv signal would go out, the bed was too hard, and the A/C unit would not stay on. "Clean but very uncomfortable beds"
The hotel is as close to my location as I could get, but still 5 miles away. Has a nice view of the lake from the road. Clean and what you would expect from a hotel. However, the bed was very uncomfortable. Felt lumpy and lopsided like I would roll out. Very hard too. Didn't sleep well. I will book again. I had a very pleasant experience. I only had an issue with our tub draining slowly. Great location between restaurants, grocery, stores, and Ren Fest. Staff was friendly and helpful. Plenty of breakfast food available. "What?! We have to carry our luggage up stairs?!" The hotel staff are very friendly and helpful. The location was perfect: walking distance to shops and restaurants. A view of the lake was right across the street. The beds were very comfortable and everything in the room worked. The breakfast was great! Lots of variety both hot and cold items available. The staff kept things well stocked. The softest bed ever. Only made me realize how bad I need a new one?? we stayed here for our wedding night and was able to get a lot of family there so it was a great night. Hotel breakfast was great. "Nice location to Lake Conroe activities"
We arrived about 3 weeks after Hurricane Harvey for a wedding another 5 miles north. Lake Conroe is about 1 hour northwest of Houston. The only negative is that the rooms smelled a bit musty, could be that because of the humidity the room hasn't been aired out in a long time. The smell was not noticeable after a few minutes. The rooms were comfortable and clean otherwise. The staff was friendly, especially the front desk staff. There were nine of us in for the wedding and the staff allowed us to congregate in the breakfast room to chat and play games when not at events pertaining to the wedding. Some members of the family enjoyed the pool. "Senior Citizens - Harvey evacuees"
We came cold, wet and emotionally spent after watching our boat ravaged by high winds, high waves, and driving rain. Focusing on the boat we did not realize the water was approaching our house. We called the closest motel as we evacuated. Nice room and hotel staff. Lots of restaurants in the immediate area and right across from the lake. Only bummer was no real butter with the breakfast! Surprising for Texas. Very good price per night and we had a free night with our Best Western points! "Staff is very unfriendly,and not very helpful." This hotel does not have any meeting room for four people. The staff was, not very helpful. The meeting was held in my room (to late to change anything), a very poor setting, for a professional. The staff did not even want; to give me a chair, for one of personnel. If you traveling for business by pass this hotel . Do not stop there!! Hotel was nice, clean, near the main road. Staff was friendly. We spent little time there but all was fine. The only issue was the door did not "catch" and stay closed unless you really shut it hard. I told them about it at check out. I would stay there again. I will come back again, I will tell my friends n family about my wonderful stay. Room services is awesome. The food is so yummy. The view to the lake is beautiful no matter what side you stayed. Thar staff is very friendly with a smile. This is one of the nicest Best Westerns we have stayed in. The outside was clean the rooms were clean and comfortable and the staff was very helpful. The pool and pool area was clean, all except no spa. We will be returning and encouraging our friends to stay there when they are in the area. "Sweet front counter person. Bad follow-up by the manager of this hotel." Very sad to say that I am still waiting for my refund. The manager has been unavailable for the last week. My room was not clean and there was no housekeeping person to clean it. ( I will leave out the nasty details of the room.) The front counter girl had to come to my room and clean the problem. She did her best. She called the manager who basically told her to deal with it. There were no other rooms to change into because they were all booked. Stayed here before and after being in a wedding at a nearby venue. Checked in but did not go to room until late that first night after dinner. Sure wish I would have. Room absolutely smelled horrible. Very strong mold/mildew smell. Had to get an air freshener and prop on top of AC. Friend's room smelled fine, bride's room stunk also. Room was clean, with a couple of small dead bugs in bathroom corners. Shower head only sprayed out of one side. Must be clogged. Bed was comfortable, but pillows were not. Fridge in room worked well. Small complaint: when housekeeping came on morning of 2nd day, they removed the hand soap and hand towel, but did not replace! No big deal on the towel, but wasteful on the soap to throw away after one use. Hotel is close to several restaurants, gas station across street, and daiquiri barn across street too. Alas, we did not get to partake! At check out, no one was in office. Left keys on counter. The rooms had a faint smell of mildrew. We stayed 3 nights and the coffee packet was never replaced in the room. The toilet stopped up at 7:00 a.m. But housekeeping doesn't start until 9:00. They gave us a plunger but that didn't work. We were on the second floor and had two 5 year olds and had to go down and use the office bathroom. The pool is great for kids though. 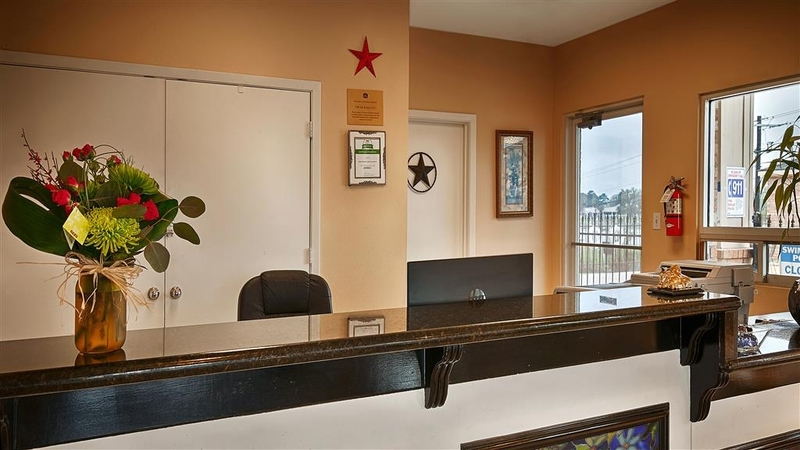 "Great view and nice hotel"
Great view of lake Conroe. The hotel is clean and updated. There was a small pool overlooking the lake. I only spent one night but it was quiet and peaceful. There are plenty of restaurants within walking distance. A great hotel with a very comfortable bed. The hotel was close to everything that I visited from restaurants to shopping and was easy driving to and from Houston. The staff was very friendly and did their very best to help at all times. The lighting for the main mirror was more like a night light. Not functional at all. There was hair left in the shower from the previous occupants. And the scorpions in my room were not welcome. I will never stay at this hotel again. nice, quiet hotel small but nice pool facing the lake and the highway. Clean and well appointed rooms. Close to everything and the amazing lake. Conroe, Montgomery and surrounding areas are beautiful. Lots to do for family outings, golf, lake excursions and rental availability. The hotel was great! Friendly staff and very clean. Stayed for two nights for an event at the lake and it was very close to all the activities around the lake and in the town of Montgomery. We will probably visit again. Great rooms very clean. Good hot breakfast managed to keep it stocked. Very nice remodeling. Fast wifi. In all great place to stay. Across from the lake great view from the pool are. Nice places to eat close by. "Meh. Lots of room for improvement"
Loud A/C, bugs on shower, humid smell in the room, fluctuating water pressure and temperature on shower. The rest of the room was fine. Towels were a a little small but OK. Also, this felt like a motel, not a hotel. Older motel which has been extensively redecorated. Comfortable beds. Beautiful view of the lake. However, nasty, musty odor permeates every room. So much so, that our clothes started to take on the odor. I think this hotel has been recently updated. The rooms are nice and the staff is friendly and it is very close to the lake. We have stayed here many times and it is always pleasant. We will definitely stay here again next year. "Really don't want anyone to know how great this hotel is"
A great hotel that I have stayed in on a number of occasions. Pet friendly with a small deposit. Good breakfast, clean rooms and comfy beds. Close to many types of stores, restaurants and the lake. Boat rental just up the road too. The room was clean... the breakfast was good... Tv remote did not work .. Shower head broken.. Staff was very friendly .. the bed was comfortable.. that is about it... don't have much else.. a fast food restaurant near.. The room was good a little small but very clean. Across the road from the lake and the road was very busy. No real good restaurants around it and they did have a very good breakfast. Would like to of had more to do on the hotel side of the road wr went back this weekend but stayed at another place. Probably wont go back to best western again but its not against the hotel its the location. I was delighted with my experience at Best Western in Montgomery, Texas! I particularly appreciated the lady who made my reservation. She was very helpful and made me look forward to staying for the first time at this motel. She said they were full but she offered me a handicap room, which worked out very well. "Excellent small local hotel close to the lake"
Rooms and facility upgraded since my last stay. Comfortable, tasteful decor....staff professional, courteous, quick check-in and check-out. Pool appeared clean and in excellent condition. Located close to several restaurants from fast food to full Mexican indoor dining, a seafood restaurant with lakefront dining. Breakfast included w room and served near lobby. We stayed five nights and four days...The rooms were clean and over all was a quiet place to sleep after long days of adventure in the sun...We had a few problems with the weekened staff but it was something that was quickly resolved..Definitely would stay again. Comfortable bed, clean room, big tv with many channels selections, location was good for what I required, and a nice hot and cold breakfast selections. Staff was friendly and did a few extra things on check in to save me time and effort. "Nice room facing back side of the hotel where there is undeveloped land." I looked at their website and got the wrong impression of where the lake was from seeing one of their outside photos. I thought it was behind the hotel (where rooms had a water view). Turns out the END of the hotel faces the water. Yes, you can see the water if you go out your door and stand on the balcony that runs by all the doors. There was mold on the lower part of our shower curtain and a good-sized rip near the foot of the bed on the bed skirt. However, those two things aside, we enjoyed the room. We heard at check-in that they occasionally see deer, owl(s) and leatherneck turtle(s) in that undeveloped land. I kept watching but never saw any. "Best Western Conroe Lake TX"
This old "Motel" seemed to have been recently remodeled. The room was very clean, Nice flat-screen TV with plenty of channels that all worked well. The bed and pillows were comfortable. The coffee in-room, shampoos, etc. were properly replaced each day. I stayed her because I was taking a course very nearby and there was only a Super 8 as another option. My expectation was not high, but it was a nice clean motel and I have absolutely no complaints from my stay. "Good place to stay for Texas Renaissance Festival"
Adequate, clean lodging. Pleasant, helpful t staff. Breakfast! Would have liked an architectural design that offered elevators to upper floors and an indoor hot tub, but for the price it was just fine. We didn't spend a whole lot of time in the hotel room anyway. My room was, thankfully, on the ground floor. Conveniently close to relatives. Quiet even though on major highway. Room and breakfast average for this class of hotel. Several restaurants and grocery stores within 5 miles. Kayaking, fishing and swimming nearby at Lake Conroe. "where to stay around Conroe texas"
We reserved rooms for my daughters wedding. The rooms were very clean and the hotel in great condition. We have a very comfortable stay. The staff was friendly and the breakfast was delicious. We would stay there again. The lady at the front desk was very nice although I didn't catch her name. She even helped me with my allergies by giving me some Tazo Cinammon Spice tea that helped me feel better during my stay. I would definitely stay there again. Its hard to get into because of the traffic on F M 105. BUT the LOCATION is wonderful. The lake is there the food venues are many Mexican, seafood, Asian, Texas size Steakhouse , there are many of each and lots of fast foods. "Best Western Lake Conroe Tx"
I would not recommend the Best Western in Lake Conroe unless you are desperate for a hotel near the lake. I assume this is the case for the majority of people that stay here and this is why they can charge what they do. It was expensive with very few amenities. The rooms are not great and the smell was awful. They used air freshener that was overwhelming. Perhaps someone had smoked in the room. It was just ok, not a great hotel at all. The room was nice and very comfortable. The only issue for me was that I am short and the bed was too high for me to easily get on. The breakfast was amazing, bacon, eggs, sausage, breads, oatmeal, etc. Although the room was very clean and the bed was comfortble I had to shower with lukewarm water and the tub faucet was about to fall off. I liked the fact that it was close to the lake as I was fishing a two day bass tournament. We stayed 2 nights to attend a wedding at the Renaissance Festival. Nice clean room. About 24 miles from Ren Fair. Conroe and the Lake where nice to explore also since the hotel is across the street from the lake. My husband and I stayed here for a couples getaway weekend.Excellent location. It is right across from Papas on the Lake as well as other places to eat and has a view of the lake from the pool. The pool was very relaxing. Hotel does not have a hot tub and there is a lot of highway noise in the pool area. The room was clean and housekeeping and staff very helpful. We liked that you can have the air conditioner fan stay on to block out any noise but the rooms are quite anyway. Love the waffles! We loved our stay here. The rooms were very clean and a great value. It is right across the street from Papas on the Lake and very close to other eating places. You can see the lake from the hotel.The pool was very relaxing but is a little loud from the highway noise. It would have been nice to have a hot tub. Love the waffles! We will stay again! If you are in the Montgomery area, this is the place to stay. 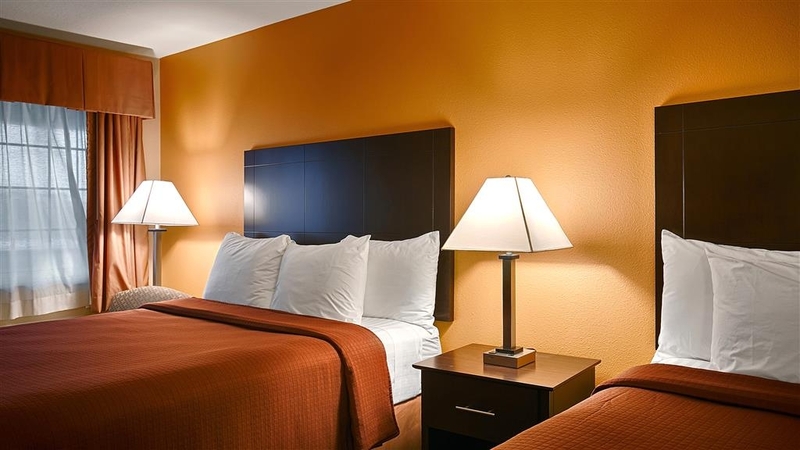 Comfortable beds, large rooms, and friendly staff. A lot of bugs towards the back side of the hotel but nothing a good repellant can't fix. Looking forward to staying here in the future. Other than the open condom wrapper found in my room and the AC not that great. The bed was super comfy and the staff were great. I didn't have the breakfast but my Fiance did and he said it was satisfactory. "Good value for the Money"
The Best Western was recommended for wedding guests attending a wedding nearby. The hotel was clean, the staff was friendly and helpful, and breakfast (with eggs, biscuits and waffles) was more than adequate. This property is modest with a tiny pool and noisy air conditioners. However, it is quite a bargain for the price. "End of summer fun, Boating on Lake Conroe!" We booked this hotel for a end of summer trip to go boating on Lake Conroe before heading to Dallas the next day. We arrived around 10:30 am and asked if we could check in early. Bee at the front desk said early check in was at 1:00pm but made an exception for us and got us into a clean room. My wife and kids were staying the night, but my sister in law and her kids also came up to spend the day on the lake. Problem is, my boat can't take all of us out at once. Checking in early was great so they could hang out at the pool and in the AC while we took turns on the boat. The hotel is right across the freeway from a marina, a Jack in the box, and right next door is a Popeyes Chicken and a Sonic. The pool is small but very clean. The kids enjoyed it. We all ate lunch on the pool deck. The room was very clean and seemed like it had been painted and updated. It had a fridge, microwave and TV. My son used the wifi and said it was a good connection. Had a coffee maker and hair dryer. The bathroom was very clean, and the beds were very comfortable and clean. Has a super-flush toilet which is great, but can be loud if someone gets up to go to the bathroom at night. They have a lot in the back where you can park your car and boat trailer. The parking lot was very clean and well lit. For breakfast they had eggs, sausage, biscuits and gravy, cereal, yogurt, fruit, OJ, Milk, Coffee, toast, waffles, etc, etc. A very nice breakfast for a Best Western. The eating area was also very clean. The staff was very nice, and when we checked out I thanked Bee for our stay and letting us check in early. She is super nice and said they strive to make their customers happy. We will definitely be back again for more fun on the lake! Thanks again Bee. 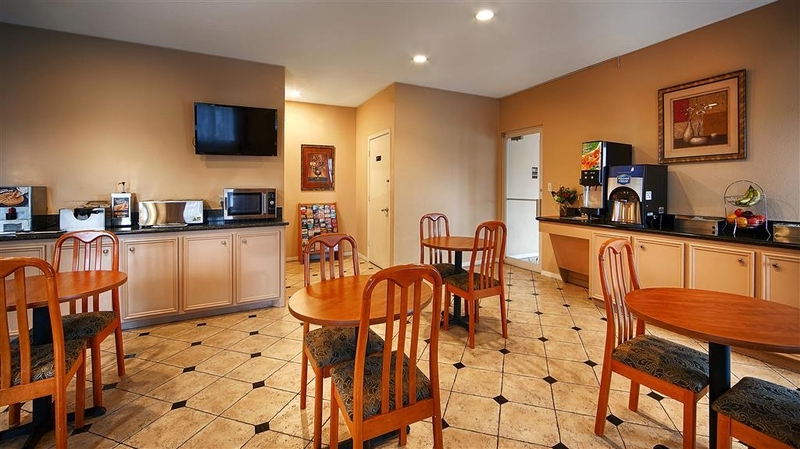 "Best Western Lake Conroe, TX"
Rooms are clean. Staff is accommodating and friendly. Breakfast has protein, not only sugary starches. There is a pool, but no hot tub. Only two lounge chairs. Very close to Papa's across the street, a very happening place! Lots to do there. Hotel has only one ice machine. This hotel was used again by our golf group. 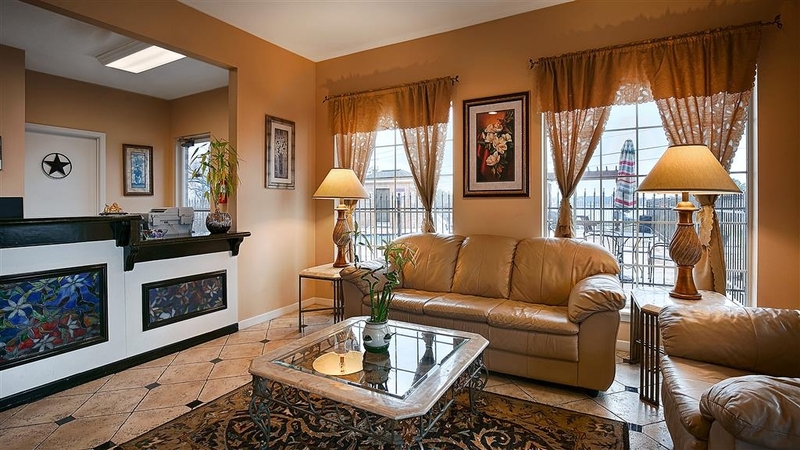 Good location close to course and proximity to good restaurants. The staff was excellent and friendly. The breakfast served was very good and convenient for our golf group. The A/C fan ran even when compressor wasn't engaged thus drowning out the fast vehicles on 105. We had no complaints. "Staff was friendly, cleanliness just okay." Bathroom wasn't super clean -- the corners had dirt in them, and the rim above the tub had a thick layer of dust. I wished they had a water cooler for drinking water -- the tap water tasted like chlorine. The staff seemed helpful and friendly. Awesome customer service and equally awesome breakfast!! The fireworks show on the lake wasn't much but it was still a wonderful stay. I thought the pool was a bit small but it even turned out to be perfect! I visited this hotel a few years ago, and the owners then, the same as now, were very receptive to comments. Since then, they have updated the property, and it is really special. Please support them, steer clear of the Super 8 nearby, and enjoy your stay. "Nice surprise for a BW property!" My expectations were exceeded by my stay here. I had anticipated typical Best Western standards, but my experience was much better. The room was comfortable and well-apportioned. The staff was friendly and helpful. The location fit my needs perfectly. Highly recommend. we stayed at this hotel because it was about 4 miles from the venue for my son's wedding. the hotel was great. we stayed on the back side that overlooked a bunch of trees and not just a parking lot which was nice. we could even see Lake conroe across the street when on our balcony. Our stay was comfortable. I have 2 suggestions... maybe have pest control come more often - we had a couple roaches in our bathroom. also, suggest an air guard/flow director on the vents of the AC unit. the air blowing up made the left side of the curtain blow open all night and light from street light was getting in. The new owners and management team have made appreciable improvements in the property. Be aware, this is a motel, right on the main highway through town. However, the front desk worked with me to get a room as far away from the road as possible; thankfully, there was no road noise. I had a single king room, non-smoking. The room was fresh, no latent smoke smell from years gone by. My mattress was quite comfortable, I got a great night's sleep. My room was equipped with a microwave and frig, love that when I am traveling. I thought the rates were about right for the this type of room and facility. Although I didn't have a chance to use it, the pool is in great shape, again, everything has been painted and looks fresh. The pool faces the highway so it will be noisy. Lots of fast food and lake-type dining available. It is directly across from the park with access to a pool. Would probably work well for families. I would stay here again. BTW, I was not a fan of the breakfast, but there are plenty of choices in the area. Great Location off the Hwy and directly across the street for the lake and the park, Rooms are not the Cleanest, but not disgustingly filthy. I like that the rooms are exterior entering so you don't have to go thru lobby and can back right to your door. I would stay again. "Great Value and they welcomed my dogs"
Traveling with 2 labradors presents issues with finding hotels that accept large dogs, and at an affordable charge. 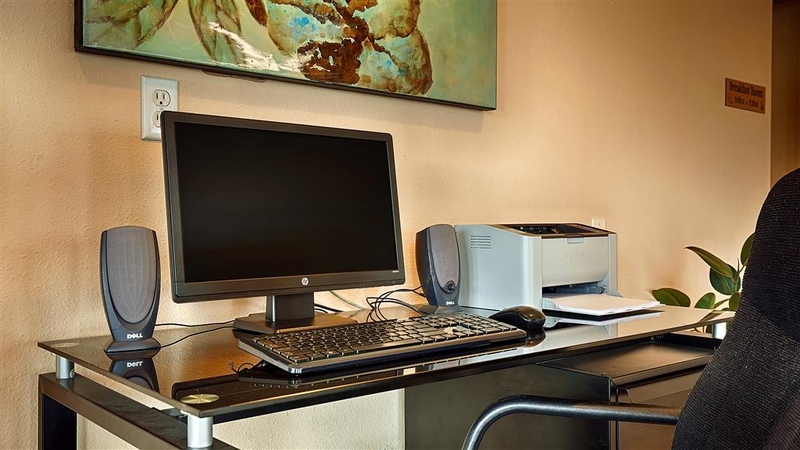 Best Western Lake Conroe Inn welcomed my 2 labs, and yes I paid an additional fee, but with my AAA discount, the additional cost still made the overall nightly fee affordable. Plenty of grass to walk my dogs. Thanks! "Average Motel near Lake Conroe"
There is nothing wrong with this place, but be aware, this is a MOTEL not a HOTEL! Near the lake and clean. Nice pool with food nearby. Check in was easy. Rooms were clean. breakfast was not very great, but it was free, and there are other options nearby. The hotel was a quiet place to stay and the room was cozy. We asked for a late check out but the request didn't get passed to the morning crew so housekeeping was banging on the door all morning. Otherwise everything was nice. Although this hotel wasn't one of the best Best Western Hotels we've stayed in, it wasn't bad. The problem is,the room is not of the quality for what they charge. On our next trip to Lake Conroe , we will try the other Best Western about 10 miles away. "Pleasant and reliable midrange hotel"
This is a pleasant family hotel. Although the weather was warm, the pool was closed, which was annoying. It's next to fast food places. It's right on the highway so it's a little noisy outside but the rooms are OK. You can see the lake across the highway but the rooms do not have lake views. "Satisfactory and Clean, Quiet Access is Good"
Very Good ..only one other hotel in the area..Very satisfactory A short business meeting..Everything you need is nearby, or at the Hotel.There is nothing else to say the request for 200 words is a waste of my time not relevant to the survey, I have no more time to spend with this matter. Wonderful stay, excellent service, very clean, handy to where we needed to go, handy parking, was clean on the outside. The breakfast was very good. There were many choices of what a person wanted on the breakfast menu. rooms are updated with new furnishings. The are also very clean and well maintained. Breakfast food is fresh and has plenty of options . I would highly recommend to stay there if you are anywhere in the area. I'll admit, when my wife first suggested we stay at a Best Western, I immediately started an argument for why we should spend an extra 10 minutes driving and stay at a hotel chain I normally stay at. She won, of course, and I ended up being very surprised at the overall quality of the hotel. WiFi is ok, and breakfast is a joke. But we were mostly hanging out with family in the area, so neither of these was overly important. Overall, this was infinitely better than my last Best Western experience from a 5 years ago. The first room we got was soaking wet. we called the front desk. The front desk clerk got us another room. We didn't care for the noise from the road near by. If you stay there don't stay in room 225. I wanted to stay down stairs they didn't have any rooms. Fabulous place to meet and well maintained. Very clean ?? I will recommend to anyone ??? we come from different directions so, as I said, perfect place. Enjoyed eating at jacks famous fajitas or famous fajita jacks??? Very clean rooms and grounds. The bed was great! They have a great hot breakfast with eggs, bacon, and sausage, as well as the usual pastries. They keep the food well stocked. It is a little pricey sometimes for a hotel with no elevator. They accomedated my downstairs request, however. This hotel has obviously been updated. New carpet, clean bedding, comfortable mattress, nice furniture, clean bathroom but older tub. No elevator so you might want to request lower room if you have a lot of luggage. Nice hotel, near restaurants. Fairly nice grassy area behind hotel for a potty trip with your pet. This area was clean, so I assume that most owners are pretty responsible with their pets or the hotel does a pretty good job a keeping it up. Hard to get to a park. Don't think the park across the street is a safe bet. I could not access it, ended walking our dog at a strip mall. The room was clean. "BY FAR, the worst place we ever stayed"
Hurry and read, I bet this dont stay up long. The only thing I found pleasent was the girls at the front desk. They were very friendly. This is our outline of why I rated it as I did. * Started out, the girl at the front had a hard time checking us in. She said she had to move rooms around because it was saying they were Full and she knew it wasnt. It happened to her on the last one as well. * Upon entering out room, it smelled like wet carpet and Stunk. See next note and you will probably understand why, as I did. * Toilet would not flush properly, 1/2 stopped up. Informed front desk Saturday morning of such. * Found and killed Scorpion in Room. Sure Happy my 9 year old grandson was not stung by it. (Informed front desk of such, she said she would make note for her manager) * Went to our Festival, upon arriving back to our room, room Key did not work. Went to front desk to get Key cards reset. We ask if maintenance had taken care of the toilet, was informed it was. * Toilet not repaired. Upon check out, I informed the front desk of such to be told, yep, the maintenace man needs to buy something from Home depo to fix it. * With all the above, I feel that it is a Motel at a Hotel Price, and not a very good one at that. If you're in the Conroe/Montgomery area, this is a good place to stay. Easy access to everything. The hotel is only 2 stories, so if you can't climb steps, you need to specify in your reservation that you need the first floor. Always a good value staying at a Best Western. This one did have a very nice view across the way of the lake. Hotel was fine, only issue was the breakfast on Sunday morning. Crowded, too small eating area for the number of guests that morning. They kept running out of food set out (scrambled eggs with cheese, sausage, bacon, toast), and the poor young lady at the front desk was pulling double duty trying to keep the breakfast area stocked up. Coffee was good, though. Very good location - do ask for a room at the back to get away from the Hwy 105 noise. Had a good lunch across the street at Papa's On The Lake. It was fun as they had a bunch of people with speed boats gathering there before they all left together for a spin around the lake. Dinner at Phil's Roadhouse in Montgomery was pretty good, as was breakfast at Magnolia Diner. Lake Conroe area is pretty cool with some very nice views. This was a very pleasant resort. We were only able to stay one night, but would have loved to stay longer. The staff was very helpful and friendly, and the rooms were clean and comfortable. Excellent choice, and pet friendly! "Very nice view of the lake"
Nice motel with great views of the lake. Papa's on the Lake restaurant across street with nice atmosphere, band and good food prices. Food rating, OK.. My husband and I enjoyed our stay and would recommend this motel. The hotel is not that old but at the rate of the non upkeep it is going down hill fast. The staff was barely breathing. The wash rags looked liked cleaning rags. The curtains had nasty on them. The bed skirt had something that I have no idea what it was on it. We like to fish at Inland Discount Marina. Best Western is perfect for us. 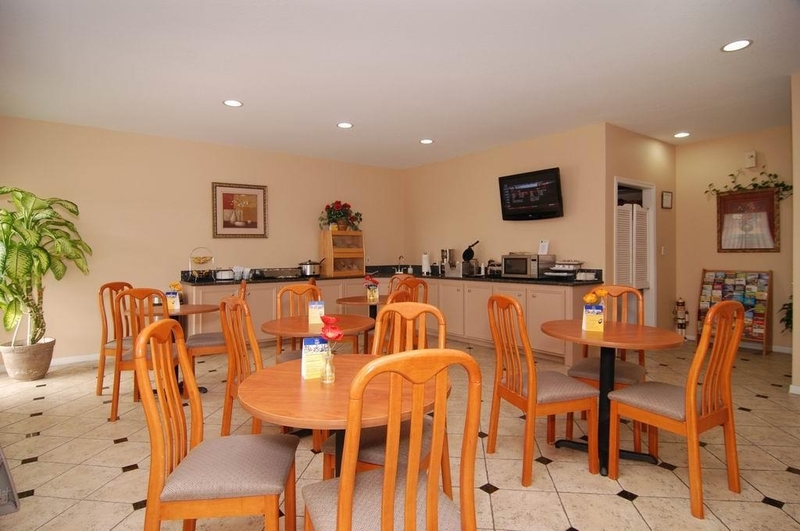 The motel is located close to our marina and to a host of places to eat. Very comfortable rooms. The manager is extremely nice as well as the other employees. We did not eat breakfast, but the coffee was delicious and hot. We did partake of the yogurt they had available for a late night snack. "Clean and solid, great value if you just need a place to sleep while enjoying the area." Stayed two nights over Labor Day weekend. Just needed a place to sleep at night after enjoying a food festival close by. Very Close to Lake Conroe and several restaurants and grocery stores. Stayed on second floor ( recommended if you can climb two sets of stairs). Room had two double beds which suited our needs with two young kiddos. Beds were super comfy and room had a fridge and free WiFi. Got AAA rates which means we paid under $120 p/night and it included free breakfast( pastries, cereal, yogurts, bacon, scrambled eggs etc) Hotel had a small but well maintained outdoor pool. Good value for money. Water was extremely hot. Beds were comfortable. Breakfast was good. My daughter and I spent 4 nights at this location. The previous night we spent at the Best Western in Blackwell, OK. The difference between the 2 properties was like night and day, with the Blackwell location being well above average in every category.